The technology giant is in talks with programmers to offer a slimmed-down bundle of TV networks this fall, according to people familiar with the matter. The service would have about 25 channels, anchored by broadcasters such as ABC, CBS and Fox and would be available on Apple devices such as the Apple TV, they said. For now, the talks don’t involve NBCUniversal, owner of the NBC broadcast network and cable channels like USA and Bravo, because of a falling-out between Apple and NBCUniversal parent company Comcast Corp., the people familiar with the matter said. Cable TV is socialism that works; subscribers pay equally for everything, and watch only what they want, to the benefit of everyone. Any “grand vision” Apple, or any other tech company, has for television is likely to sustain the current model, not disrupt it directly. That certainly seemed to be the plan for Apple; from what I understand, the Wall Street Journal’s characterization of Apple’s talks with Comcast is correct: Apple originally sought to work with Comcast much as they have worked with telecoms around the world – Apple would provide the user interface (the cable box) and Comcast the infrastructure and live content. However, I can’t say I’m surprised those talks fell apart; to understand why a disagreement was probably inevitable, as well as why Apple’s Plan B looks the way it does,1 it’s useful to step back and consider the overall structure of the TV industry and how and why that structure is evolving with the advent of the Internet and mobile devices. Content creation, production, and aggregation are frequently handled by conglomerates that manage multiple channels, including Disney, Viacom, Fox, etc. This neat division, though, misses an essential piece: affiliate fees. Way back in 1982 ESPN was just a startup struggling to make a profit with advertising when a new vice-president, Roger Werner, came up with the idea of charging cable companies for the privilege of carrying the sports network. As you might expect cable operators were not interested, but when ESPN, already cable’s largest network, threatened that they were about to go out of business, about half of cable operators gave in. Within a few years, especially after ESPN secured the rights to National Football League games in 1987, they all had. Poor cable companies…well, not so poor. The cable companies weren’t exactly on the road to the poor house thanks to their natural monopoly. Cable TV was originally called “Community Antenna Television” as its purpose was providing access to broadcast TV for communities unable to receive strong over-the-air signals, but over time, particularly with the rise of multi-unit housing, even communities with strong broadcast signals saw the need for cable systems and contracted with private companies to build out the physical infrastructure. These companies didn’t just get to leverage local governments’ unique powers such as eminent domain, but they also retained control of the lines themselves, eventually adding new cable-only stations in addition to the broadcast networks3. Over time various alternatives have arisen, including TV delivered over DSL and satellite, but by and large the cable companies have had significant pricing power. Everyone is making money: the cable companies make rent on their infrastructure while the content creators earn affiliate fees on top of advertising. And truthfully, while this seems like a raw deal for subscribers – they are the ones paying for those rising affiliate fees in particular – the reality is that this system has resulted in an absolute golden age in content. The advertising-only model of the 60s and 70s resulted in blah, lowest-common-denominator content; the affiliate fee model, on the other hand, meant content creators had to have must-see content for some fraction of subscribers – that was their leverage for jacking up affiliate fees. Some, like ESPN, have bought that must-see status with exclusive sports rights deals, while others, like AMC, have earned it with compelling content like Mad Men or Breaking Bad. It should be pointed out that HBO has never quite fit this model; unlike most cable companies HBO does not earn affiliate fees from every single cable customer whether or not they care for HBO. Rather, HBO charges a higher fee (~$15/month) only of customers who explicitly want the network (pursuant to the above industry model, though, HBO has long relied on the cable companies to actually manage the customer relationship). This means that the burden has long been especially high on HBO to not just earn customers’ attention but also their money: small wonder the network has produced amazing TV like The Sopranos, The Wire, or Game of Thrones. All in all, I think this is a win-win-win: consumers pay a monthly fee that seems steep but that is actually quite cheap when you consider how much TV the typical home watches, cable companies collect rent and manage the customer relationship (poorly, but that’s the nature of monopolies), and content companies compete on quality for the sake of charging ever increasing affiliate fees on top of advertising. Still, none of these shifts necessarily threatened the TV model; too many people had too many shows (especially sports) that were only available on cable, and the content owners had little incentive to break up a good thing. There is more and more evidence that actual viewership is in decline. According to Nielsen, after remaining steady for years average monthly viewing time in 2014 decreased by six hours; January was particularly bad, with viewership down 12.7 percent year over year. The biggest culprit is streaming, up 60% year over year. The problem with streaming, though, is that it too is for-pay; there are no ads on Netflix or Amazon Prime Video. In short, TV is increasingly shifting away from advertising, to affiliate fees on the network side and subscription fees on the streaming side. In that article my intent was to explain why it is that Snapchat is potentially so valuable: if advertisers are increasingly unable to reach their intended audience on TV, they will seek other channels, and Snapchat is fashioning itself into a likely recipient (the same argument applies even moreso to the serially under-appreciated Facebook – members-only). The question, though, is what about the content companies who have been relying on advertising revenue for decades? As I noted, the answer is an increasing reliance on money from the consumer. In part this is affiliate fees, but it’s also direct payment for shows on iTunes, streaming deals with Netflix and Amazon Prime, and now, potentially, this deal with Apple. Make no mistake: the content owners have had a golden goose when it came to the current TV model: provided their content is “must-see TV” content creators can charge ever increasing fees and force cable companies to deal with customer angst. The fracturing of attention, though, is not only a threat to their advertising revenue, but also makes it harder for customers – particularly young ones, the ones that advertisers covet – to justify paying ever higher monthly fees. Losing them would be a double-whammy. On the other hand, there is great opportunity as well: in the old model the billing unit was the “home”, no matter how many people might live there. With mobile devices, though, it becomes possible, even preferable, to deliver content to individuals. And, by definition, there are a lot more individuals than homes. 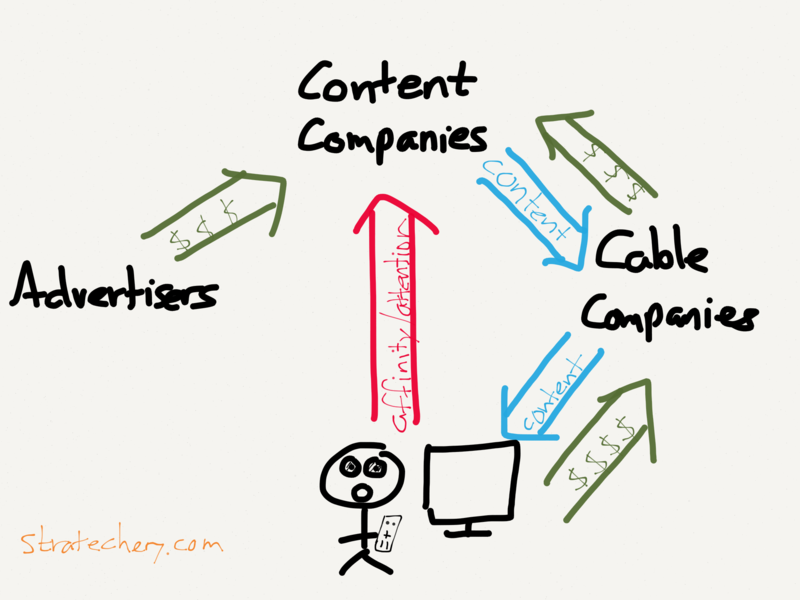 The problem for content creators is that, as noted previously, they have never developed the capabilities to deal with consumers directly; cable companies were always their intermediaries. These factors make Apple (and later, Google, Amazon, etc.) a particularly attractive partner for content companies. Apple can provide access to individuals, increasing the addressable market; Apple is one of the few companies that has successfully gotten young people to pay for content; and Apple is experienced at managing the customer relationship. I believe these factors explain why it is that HBO Now is launching first with Apple: the people willing to pay for HBO are likely already using Apple devices, Apple can get them to pay, and Apple has the infrastructure to manage the relationship. Apple is offering to share data with programming partners to get them on board with its cable-like TV network package, The Post has learned. The company is willing to share details on who its viewers are, what they watch and when they watch it to entice broadcast networks and others to go along with the service, sources said. The information could help programmers better target shows to viewers and advertisers, who are increasingly chasing niche audiences. The dynamics are much different when it comes to the cable companies, in particular Comcast. 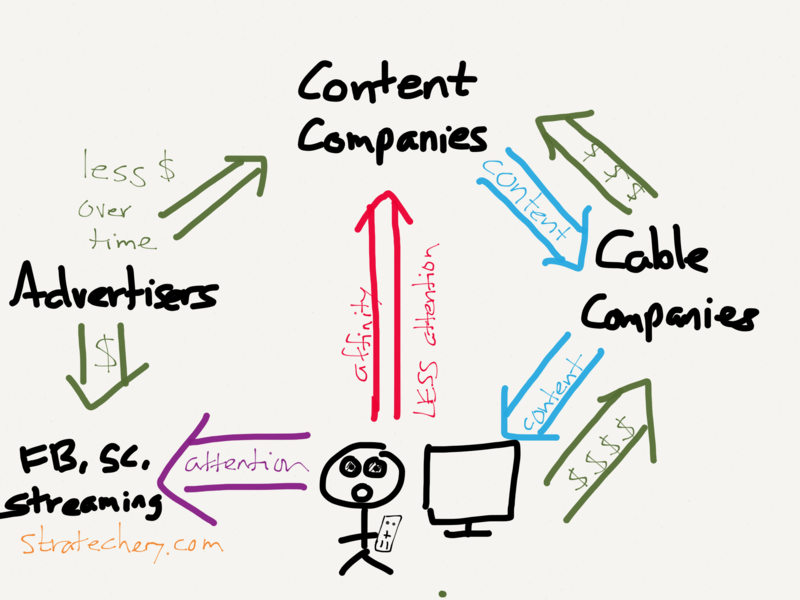 Cable companies have long viewed their ownership of the customer relationship as their core competency and the key to avoiding becoming a dumb pipe. Indeed, this is almost certainly where the Apple-Comcast negotiations broke down: an Apple TV box would be based on your Apple ID, relegating Comcast to a (theoretically) easily substitutable piece of infrastructure. That, of course, is exactly what Apple did to wireless carriers: Apple commanded tremendous loyalty from customers who wanted an iPhone regardless of which carrier they had to switch to to get it. This is intolerable to Comcast, and the deal broke down. What is particularly interesting is the fate of NBCUniversal, the media company that Comcast acquired in 2013. They are noticeably absent from the list of partners that Apple has lined up for their Web TV service, and the reason is almost certainly a strategy tax: Comcast wants to see Apple fail, and it’s likely they view withholding NBCUniversal as their best bit of leverage. I’m dubious; many of NBCUniversal’s channels including NBC, USA Network, and Bravo are widely watched, but few of them are “must-see”: only USA and CNBC rank in the top 25 in affiliate fees, and NBC has relatively few dominant sports packages outside of the Olympics, Premier League (less important in U.S.) and Sunday Night Football (which is owned by Verizon for mobile anyways). More importantly, though, I think Comcast is likely overreacting: the fact of the matter is that the Internet has made the cable companies even more powerful than they were in the days when TV dominated. All of the investment required for supporting hundreds of high definition channels lent itself wonderfully to supporting the fastest – and in many locations, only – broadband access to the Internet. Moreover, while Congress regulated just how much rent cable companies could collect on television, the latest net neutrality regulations largely give broadband providers free rein as long as they treat all content equally (the explicit model is the wireless industry, as I explained here).5 I would argue that the future for Comcast – even as a dumb pipe – is quite bright. Apple will finally, at least for some number of (likely wealthy) customers, own the interaction layer for the final frontier for tech companies: the TV. Everyone has been gunning for Input 1, and maybe, just maybe, Apple will finally pull it off. The benefit for Apple is the strengthening of their ecosystem: owning the TV will make the iPhone and Watch more valuable (see Apple’s New Market); this too is the main way in which consumers win, and why they will switch: a better UI, better integration with their devices, and a company that actually cares. Just be prepared to pay the same, if not more, than you pay today.